Cannabis is all but decriminalized. Walk down any high street in the UK and the sickly stench of skunk hangs in the air. It’s not legal, of course. But it should be, not least of all if it means that less potent forms of marijuana become more available. Skunk is brain rot for the unadventurous. This county’s remarkably leaden-headed attitude to drugs is narrowing supply towards the stronger, home-grown stuff that can be farmed in our colder climate. Why bother importing hash from north Africa when you can grow-your-own skunk in an indoor farm, with its guaranteed toxicity? Anyone keen to try a bit of weed to stymie the pain of a medical condition is faced with the prospects of a life-changing criminal charge and a hit that leaves you goofed and mentally dull. If you fancy a toke and don’t want to break the law you can always invest in legal highs, like spice and other revolting man-made gunk fashioned from desiccated carrier bags. Things are better overseas. In 1990 Donald Trump told us: “You have to legalise drugs to win the war.” In California you can buy weed legally. Colorado earns a fortune from drug taxes – just as out governments earns vast sums from other mind-altering substance, like tobacco and alcohol. 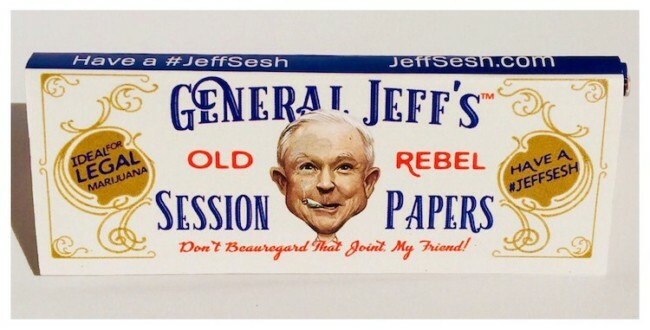 #JeffSesh is a campaign to tell Jeff Sessions:We’re not criminals, junkies or idiots. Regular Jeffs all over the country—good, responsible, patriotic Americans—have a sesh now and then… and it’s OK! Lampooning the ridiculous ban on cannabis is a great idea. They won’t listen to reason. So let’s try satire. And you can drink to that.